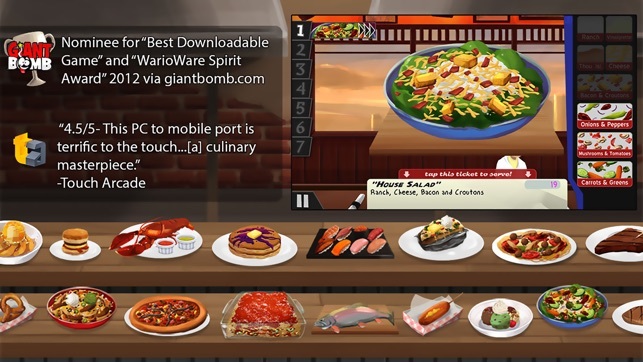 The critically acclaimed cooking sim is now available to-go on iPhone and iPod Touch 5+! 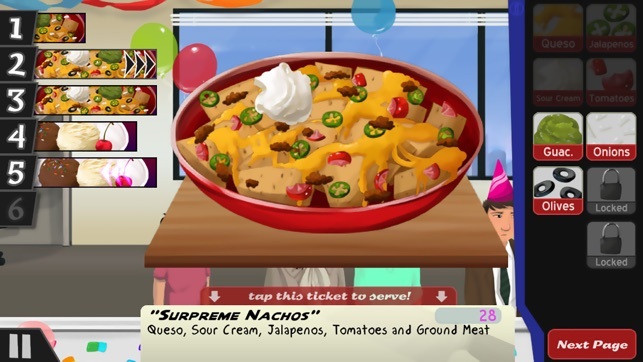 Cook, Serve, Delicious is a strategic restaurant sim, one of the few in its genre that gives the players total control over where they want to take their restaurant. And if that weren’t enough, you’ll also have the opportunity to be cast in the Iron Cook television show, throw parties for offices in SherriSoda Tower, read virtual mail in your SherriSoda Tower Email account which ranges from game tips to crazy spam, from customers providing feedback to your restaurant to opportunities to being able to fund projects via "ClicknStart" and other big surprises! 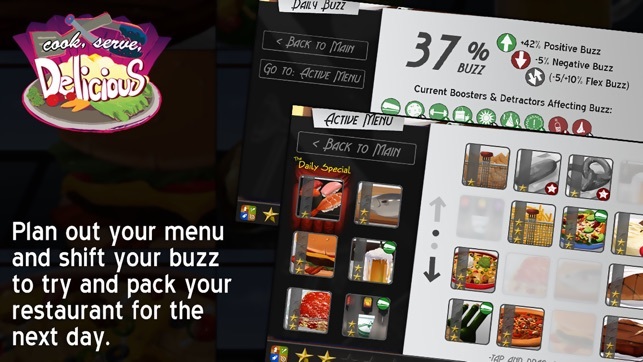 With hours of content and tons of secrets and unlockables, Cook, Serve, Delicious will provide a big challenge for anyone who’s ready to take their crumbling, rat infested eatery to a luxurious Platinum Star Restaurant. 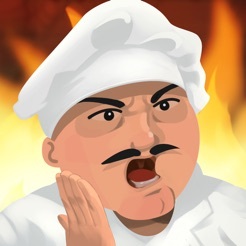 Good luck, and be sure to visit cookservedelicious.com for more news on everything related to the game and future expansions! -Fixed a crash when returning to the main menu when your email inbox is empty. -Fixed a bug when using the Upgrades menu. -Added support for future versions of iOS, including iOS 11 and beyond! Thanks for all the support! 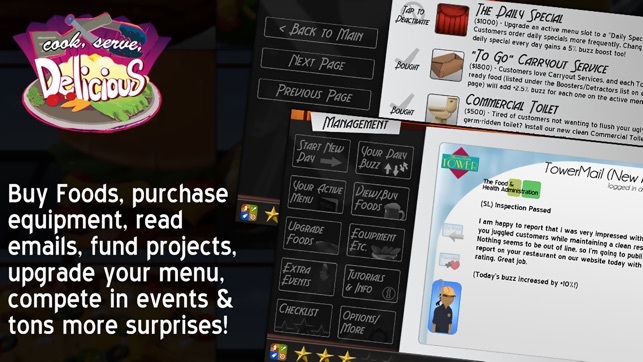 -Fixed a bug when accessing the Active Menu before buying any foods at the start of the game. considering its operating on a phone/tablet its surprisingly good at simulating the challenges of the service industry not just in the tactical elements but in all the little things. quality and efficiency count towards good reviews. good reviews count towards better customer volume long term and better tips. even chores are simulated very well here. having to stop what your doing and prioritize unclogging a toilet, taking out the trash or washing dishes is a very really challenge that you have to face in real life so i love this element and how it's unpredictable in nature. also having to plan out your active menu and keep in mind that certain items get stale to people if they are on your list for too long is interesting as well as the fact that some types of customers will be turned off to certain items existing in the restaurant while others love it is seemingly petty but a real threat when setting up a restaurant in real life. 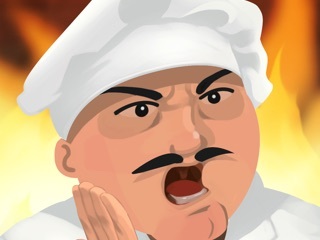 I happen to love working in the service industry and I have been looking for a game like this to keep me fresh for quite a while now and im glad to have found this gem. Definitely worth getting!!! I'm on my second play through after taking a few months off after beating it the first time. This is a great game and best of all it doesn't use the freemium model, absolutely worth the $3. It starts off a little slow as you are unlocking things and leveling up, but by the 4 and 5 star restaurant levels it is a real challenge. For some reason I just can't help screwing up the soups! My one complaint would be that you tend to end up using only about 1/4 of the foods if you want to try for a high buzz level. The other foods are fatty or otherwise drop your daily buzz so it can get a tad boring. It would be more fun to have a reason to use all the different foods throughout the day. Otherwise I love it! 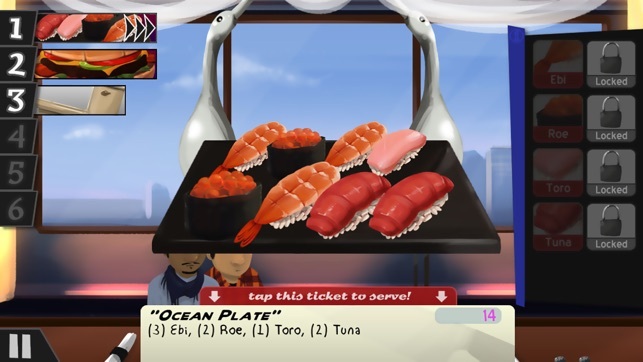 I have always liked the Cook, Serve, Delicious game since I played it on Steam. Have been playing it non stop since I downloaded on mobile. The only issue I’m having is the sound will glitch out mid day and I no longer have audio cues that make sense. Just loud screeching noises. Game works totally fine other than that. Sometimes if I pause and unpause the audio will fix itself, but only for a little while before it starts messing up again.